This page is about the sport. For the bicycle type, see BMX bike. For other uses, see BMX (disambiguation). BMX began during the early 1970s in the United States when children began racing their bicycles on dirt tracks in southern California, inspired by the motocross stars of the time. The size and availability of the Schwinn Sting-Ray and other wheelie bikes made them the natural bike of choice for these races, since they were easily customized for better handling and performance. BMX racing was a phenomenon by the mid-1970s. Children were racing standard road bikes off-road, around purpose-built tracks in California. The 1972 motorcycle racing documentary On Any Sunday is generally credited with inspiring the movement nationally in the United States; its opening scene shows kids riding their Sting-Rays off-road. By the middle of that decade, the sport achieved critical mass, and manufacturers began creating bicycles designed especially for the sport. George E. Esser founded the National Bicycle League as a non-profit bicycle motocross sanctioning organization in 1974. Before they set up the NBL, Esser and his wife, Mary, sanctioned motorcycle races with the American Motocross Association (AMA). Their two sons, Greg and Brian, raced motorcycles, but also enjoyed riding and racing BMX with their friends. It was their sons’ interest, and the lack of BMX organizations in the East, which prompted Esser to start the NBL in Florida. By 1977, the American Bicycle Association (ABA) was organized as a national sanctioning body for the growing sport. Freestyle BMX is now one of the staple events at the annual Summer X Games Extreme Sports competition and the Etnies Backyard Jam, held primarily on the East and West coasts of the United States. The popularity of the sport has increased due to its relative ease and availability of places to ride and do tricks. In the UK, BMX was a craze which took off in the early 1980s, specifically 1982/3, when it became the "must have" bicycle for children and teenagers. Previously a small niche area, BMX exploded at this time into the dominant bicycle for the younger rider, with older teenagers and even adults becoming known names through publications like BMX Bi weekly, featuring big names like Tim March and Andy Ruffell. The shift to freestyle from racing came in 1985 with popular styling moving from chrome frames and contrasting components in black blue or red being the norm, to brightly coloured bikes in one colour only, including their mag wheels and even matching tyres. Because BMX exploded into Britain's streets so suddenly, it was perhaps inevitable that it would implode with similar speed, when the children who rode the bikes left school and went to work. This was indeed the case, as by 1986/7 sales in the UK had dropped off dramatically, with the new ATB or "mountain bike" taking off and soon to become the generic adult bicycle, again from California where it had begun in the mid 1970s. In April 1981, the International BMX Federation was founded, and the first world championships were held in 1982. Since January 1993, BMX has been integrated into the Union Cycliste Internationale. In 2003, the International Olympic Committee made BMX a full medal Olympic sport for 2008 Summer Olympic Games in Beijing, China, and Māris Štrombergs (male, for Latvia) and Anne-Caroline Chausson (female, for France) became the first Olympic champions. 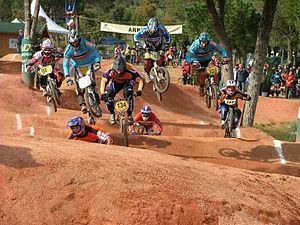 Many talented BMX riders go on to other cycling sports like downhill, including Australian Olympian Jared Graves, Eric Carter and youth BMX racer Aaron Gwin. Multiple world and Olympic champion track sprinter Chris Hoy also began as a BMX rider. ^ "University of BMX : BMX in Holland". Archived from the original on 19 October 2007. Retrieved 2007-10-14. ^ "A Short History of BMX". Retrieved 2007-10-14. ^ "BMX will be added to the 2008 Olympics (UCI press release)". 2003-07-01. Archived from the original on 2008-12-10. Retrieved 2008-10-08. ^ "Cycling BMX at Official Olympic movement site(description of sport)". Bakshi, Amar. "How the World Sees America: BMX in UK v. U.S." Washington Post/Newsweek.